Marc Petitjean and Torill Kolbu fish a drift on the Trysil River with Espen from Call of the wild. 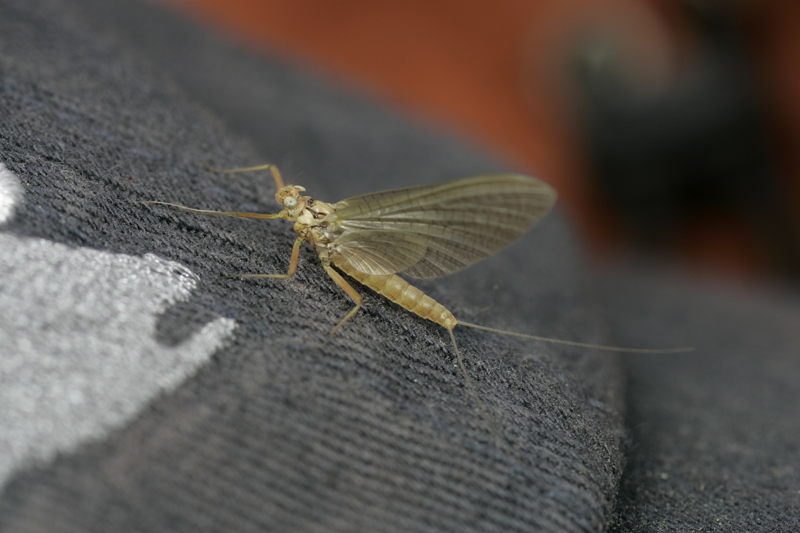 My pale yellow mayfly imitation that was easy to see on the dark water, drifted perfectly 7-8 metres from the boat, quickly approaching two rolling grayling in the next pool, that we had had our eyes on for the last 80 metres or so, drift. When without warning another, previously unseen fish rose from the depths of a dark pool and enthusiastically disappeared with my mayfly. Espen began pulling on the oars to slow our decent and dropped the anchor. I lifted my rod and it immediately assumed the golden arch position with the grayling diving deep into the pool. After a short battle my first grayling of the season was released. Late one Sunday night, 02.45 to be precise, the last week of June, I was woken when my mobile bellowed out the familiar SMS tone, was this the message that I had been waiting a week for ? “1 new message received” I pressed the keys on my mobile feverishly, as I fumbled for my reading glasses. The message read, The Danica are hatching, Come ASAP, Espen. 03.26 I was packed and in the car with only a thermos of strong black Columbian and a *Swedish General, to keep me company for the five hour drive from my home town just south of Oslo, to meet Espen Eliertsen inTrysil. 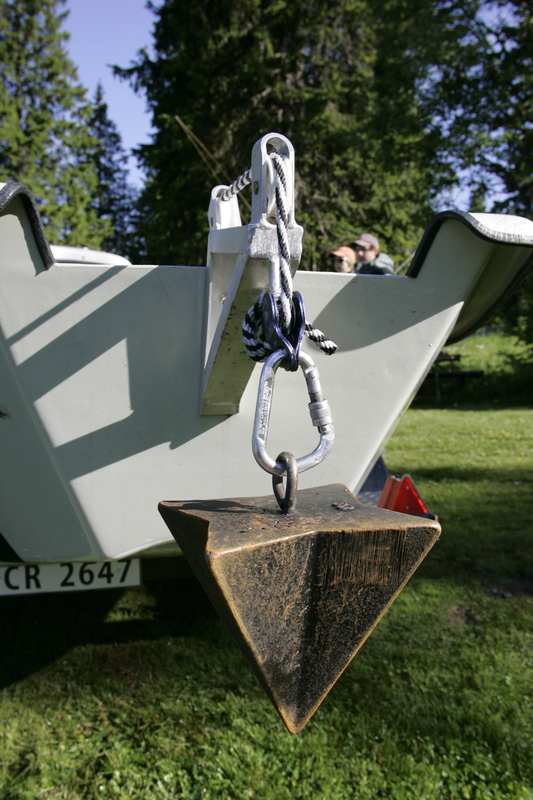 The drop anchor on one of the clacka drift boats. Rod holders are safe and well placed in the boat. 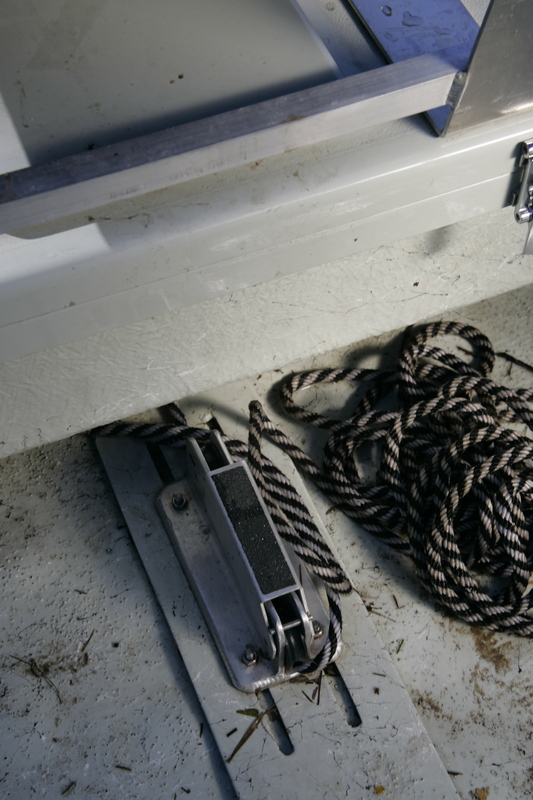 The standing support feature keeps the caster on an even keel. These McKenzie style drift boats can be traced back to old North Atlantic cod fishermen but where somewhat popularised for fly fishing by the the famous Western Novelist and fisherman Zane Grey, who used them at his fishing camp on the Rogue river. 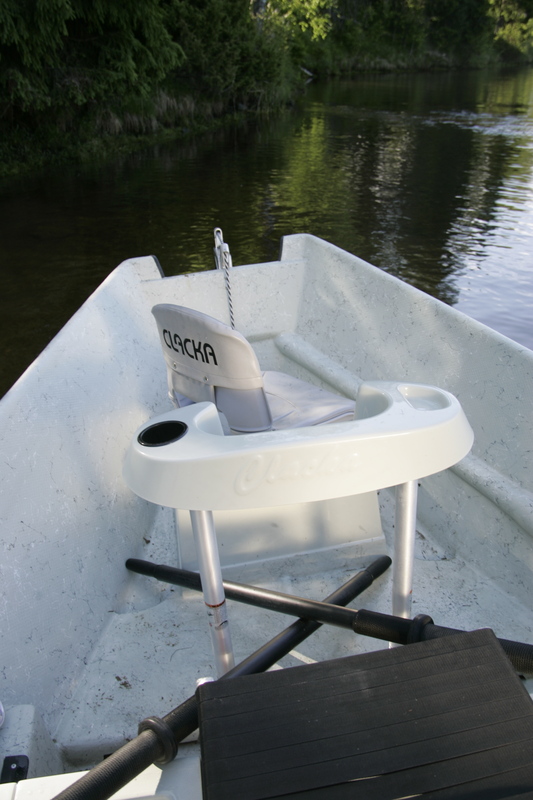 Allthough the initial overall shape of the boat has remained the same the modern design features that Clacka have used years developing, make this the ultimate river drift, fishing platform. After a brief safety talk, about what, and what not to do, not dissimilar to that you receive on a plane from a flight attendant, we where in the boat and starting the first drift. The weather forcast for the next two days was echoed in the headlines of the tabloid press, all using words as “Tropical” “Heat wave” “Over the whole of Norway” “30 degrees +”. As I understood from Espen, we needed the temperature to rise in the river, in order for the Danica to do there thing, but was this going to be too much of a good thing ? 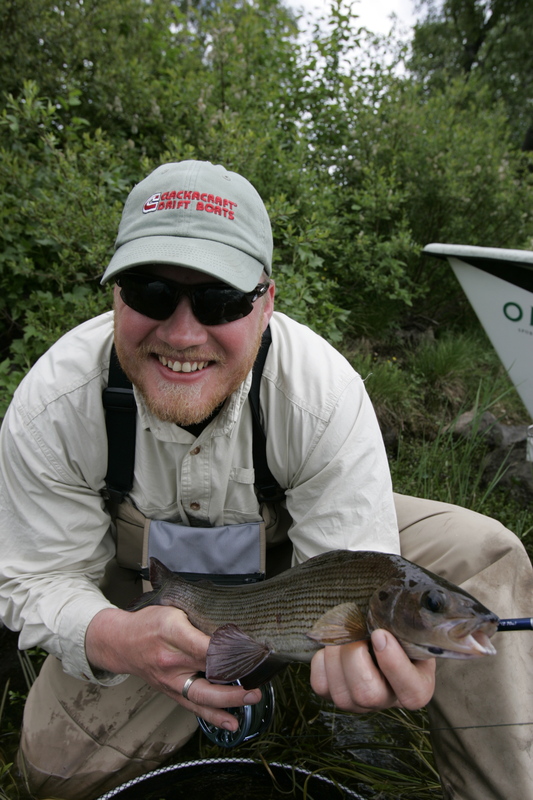 Espen with a 43 cm Trysil grayling. There where Danica and Sulpherea and Rodanis mayflies hatching everywhere, and when I say everywhere, I mean everywhere, but this being the first day of the hatch, the famous Trysil grayling were not as eager as the seagulls to take advantage of this seasonal delicacy. I couldt belive that fish where not rising! The whole river surface was covered with duns, popping up and floating like small sail boats down river. Espen re-asured me that it always takes a little time for them to start feeding on the surface when the Danica hatch first begins. The first few hours they concentrate where the food is most plentiful and that below the surface. For the next three hours we had only been in contact with a few fish and drifted just about every type of river condition from shallow rapids to fast flowing channels to flat calm slow drifts, and the Clacka drift boat in combination with Espen´s expert handling impressed me more and more, performing perfectly as a sturdy fishing and casting platform at all times. We drifted through breath taking Alaskan type landscape, with steep rising pine and spruce covered mountains on each side of us, that you only get full effect of from mid-river, down to where the river opens out and widens almost into a large basin, here Espen suggested that we take lunch, I had actually forgotten about eating but suddenly realised the almost Parkinson like symptoms my hands where showing form the consumption of way too much Columbian and General in the last ten hours and no food. So I agreed and Espen dropped the anchor in mid stream, We can sit and watch for rises as we eat lunch. It sounded like a plan. While we where finishing up sandwiches and ice cold drinks that Espen had tucked away in one of the boats many water tight storage compartments, heavy clouds began moving in from the north accompanied with a light rainfall, but still the air temperature over 25 degrees. In other words, perfect hatching weather. We noticed first one rise, close to land, not a huge splash but a typical grayling rise followed by a delicate sip, leaving the tell tale bubble the way grayling do. Shortly followed by another one not far from the boat, and yet another, and like magic, and for reasons we will probably never come to understand, small rings began to decorate the surface of the flat calm river everywhere, it had started. On the drift down the fish I had managed to take, after a few changes of fly had all fallen for a detached bodied CdC mayfly pattern of my own creation, I tied on a new one while Espen pulled up the anchor and manoeuvred the boat into a tactical casting position for what he thought was a better and steady rising fish. The anchor on these drift boats is ingenious to say the least. No disturbing the fishermen in the boat while you open hatches and dig out the rope and anchor, and then throw it overboard. This is fishing boat design at its best. All Espen has to do is step on the anchor release which is positioned by his feet where he sits to row, and the anchor is released from the back of the boat. When he needs to take in the anchor, he just pulls on the rope from his sitting position and its up again. Arve puts Jon onto another fish. 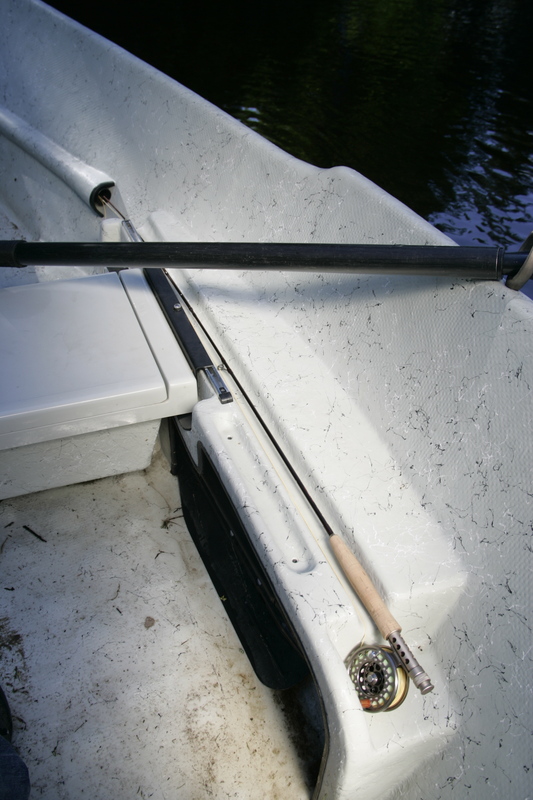 One of the other great advantages of fishing from these boats, is the boat with a little help from Espens control with the oars, gives a drifted fly the perfect drift with a minimum of mending the fly line. You are also not only casting to rising fish, but while drifting your fly is constantly covering new water and new fish. When drifting over faster runs of water you can change from dry fly to a single nymph or a set-up with a heavy nymph on the point and a couple of lighter nymphs as droppers and a strike indicator. This is not only an extremely effective method for fishing pocket water but a deadly technique for searching out larger grayling in the deeper faster water, that otherwise would be inaccessible. If you intend to maximise your fishing affectivity you can set-up two rods, one with dry fly and one with nymphs that you can alternate between as the river determines as you drift. With a new fly on the leader and Espen holding the boat steady he says ” nine o clock, 15 metres ” I lift my rod and make a couple of false casts to shake of the dry fly floatant and lie my line down in the nine o clock position, “perfect” says Espen. The fly drifts perfectly along with several naturals, one of which is 60 cm or so ahead of mine, when it slowly enters the steady risers feeding window and “sup” its gone. Mine is next in line ! and like a text book account of how it should be, the fish obliges and leaves only small rings in the surface where my fly once was. If there was only a slight breeze these rises would be impossible to see. I automatically lift the rod and my line tightens, I can feel immediately that this fish is of another class from the ones I have had contact with so far. The fish dives and enters the strong under current using his majestic dorsal fin to his advantage and holding his position deep on the bottom. After 2 or 3 minutes he succumbed to the overwhelming power of space age carbon. What a beautiful fish, 38 cm of grayling, a new personal record on dry fly. The largest fish of the day,about to be released. The rise continued for another 45 minutes or so, or five more fish, and then began to fall off until there was only the odd rise here and there. We drifted down to the bridge where we where going to take the boat on shore. While unloading the boat I noticed some hefty rising that wasn´t more than 70 cm from one of the bridge supports. There where three heavy grayling rolling in the surface one after another, each time they came up showing their whole side and dorsal fin to us. I pointed them out to Espen when he returned from the car park, you´ll have to take the boat out yourself if you want to try for them. Espen had and appointment with a priest and 20 other people that he would float them down the river as part of a mid summer eve event, and he was already running late. I just have to go and get the hanger, I´ll be back in 15 minutes. I jumped in the boat and drifted the 50 or so metres I needed to get me in casting distance and dropped the anchor. After quickly dusting my fly I could now see clearly 3 huge grayling, one of them or more, rolling every 10 – 15 seconds sucking in every dun that floated over them. I made a cast, but I had misjudged the current and mid section of my fly line began forming a rapidly increasing down stream loop, that any second was going to start stripping my fly out of a natural drift. I began mending my fly line like a mad man, trying to correct the drift before my fly sailed over the rising fish. Just before my fly entered the critical part of the drift, over the fish, I gave my rod a violent flick and lifted what fly line I could out of the water stripping my fly across the surface for about 40 cm and quickly dropped the tip of my rod again. The result was perfect and as soon as it came over the first fish he rolled and once again my line tightened. And like the other grayling it wasen´t long before he was on the bottom in mid river. Typical I thought, the best fish of the trip and no one here to help me photograph it. When I eventually brought him up to the boat and slipped the landing net under him I could see this was even bigger than my previous best fish earlier in the day. I lifted him into the boat and removed the hook. Knowing Espen was soon to return I placed the fish back in the landing net and into the water. A couple of minutes later Espen was back on the shore and I lifted the net in triumph, and shouted we need to photograph it before the light goes. After 20 or so pulls of the oars Espen was reviving the fish while I sorted out the camera gear. We returned the fish after a short photo session. 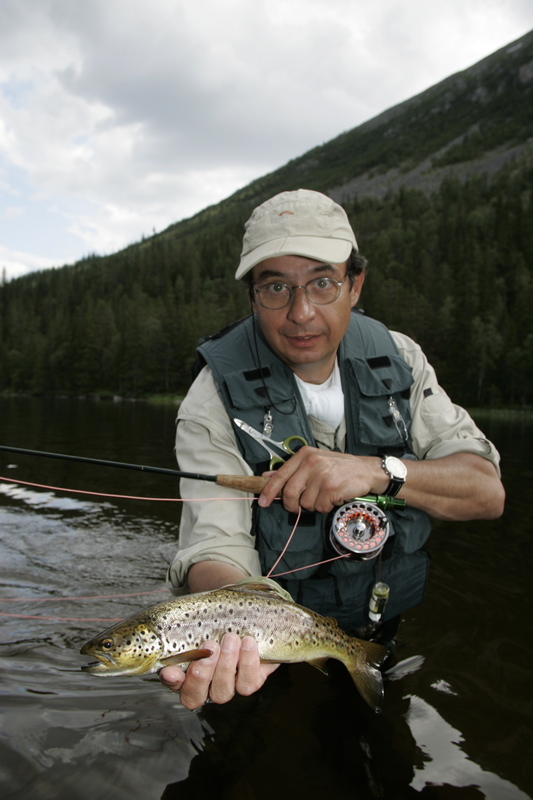 He was between 43 – 45 cm, another personal record from the river Trysil. I can strongly recommend this drift boat trip on the Trysil river for both boat and bank fishermen alike. 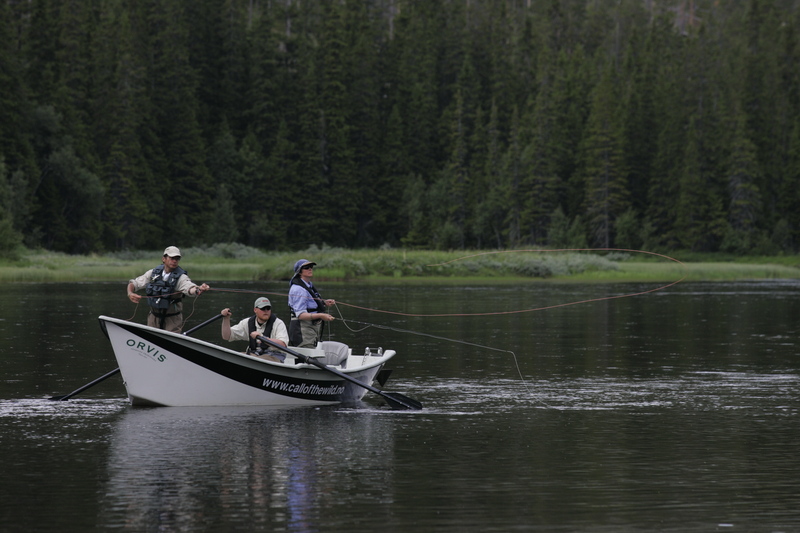 You experience a whole new type of fishing in fantastic surroundings. But it dosen´t stop at the river Tysil. The area around Trysil is full of lakes and rivers that contain not only trout and grayling but also char and pike. All the information that you need can be obtained by contacting Espen, who speaks fluent English or Destination Trysil the local tourist office. Lots more information can be obtained from Espens website. www.callofthewild.no which is also in English. Marc with a nice Trysil brown taken on the wade and fish beats. 8 hours drifting including transport too and from the river. Meet at the Trysil Hyttegrend/ Trysil fishing centre. Drive to putout sight for boat where drift will begin. Here you will be instructed about the boat and its equipment and safety. One stop approximately half way through the days drift and lunch. There will also be opportunities to stop if wished for wading and fishing on good wading stretches of the river throughout the drift especially in the shallower parts in the middle of the river, that are otherwise difficult to access without a boat. 4 hours drift including transport too and from the river. Drift a 4 hour stetch of river. There will be oppertunities to stop if wished for wading and fishing on good wading stretches of the river throughout the drift especially in the shallower parts in the middle of the river, that are otherwise difficult to access without a boat. The drift starts way north in Trysil and we drift down to Sennsjøen. The river is slow flowing here but has many fine stretches with good dry fly fishing. A very good drift with possibilities for good Grayling, trout and lower down near Sennsjøen big white fish. You will drift through fantastic landscape with good opportunities to come in contact with big fish. We start between Trysil centre and Jordet. This stretch offers a varied fishing from faster flowing stretches to slow stretches with deep pools. The Grayling dominates this stretch but there are still good possibilities for trout and down at Sennsjøen big white fish and Grayling. This drift goes through the Gjerfloen fly fishing zone of river. We drift through all types of river from slow floating to powerful rapids. Here it is only allowed to fish with fly and this stretch has a bag limit of one fish per fisherman under 38 cm. But you can continue to fish catch & release. 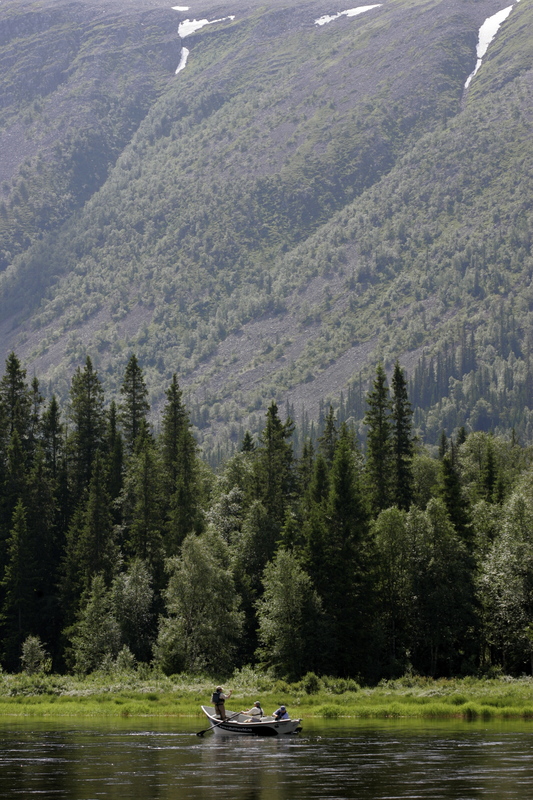 This stretch was the first of its kind in Norway. Only 20 fishing licenses sold each day. From Strandvollen bridge to Trysil centre. This stretch offers a good varied fishing for Grayling but trout are possible down near Trysil centre here are also possibilities for big white fish. This trip gives you a good introduction as to what drift boat fishing is all about. Week 28-29 Start of the caddis fly hatch. Also possible mayfly hatching. Week 30-35 Caddis hatches especially good in the evening and at night. Some mayfly hatching. Week 35-40 Second generation mayfly hatches and caddis. Normally very good fishing on days with good weather conditions right until there is ice on the water. For information on water levels and air and water temperature, hatches see Trysilflyfisher on Twitter. This entry was posted on November 12, 2012 by barryoc. It was filed under Fly Fishing, Fly fishing photography, Photography, Uncategorized and was tagged with Brown trout, Caddis, Call of the wild, Clacka craft, drift boat, Drift boat fishing, Dry Fly, Fly fish Trysil, Fly Fishing, Grayling, Mayfly, small flies.